My fifty-first stadium of 2011 was on Sunday 21st August 2011 at Bell Close in Leighton Buzzard, Bedfordshire. The match was Aylesbury United vs. Bracknell Town in the F.A. Cup Extra Preliminary Round. Bell Close is located close to Leighton Buzzard town centre, around 1 mile from the town's railway station. 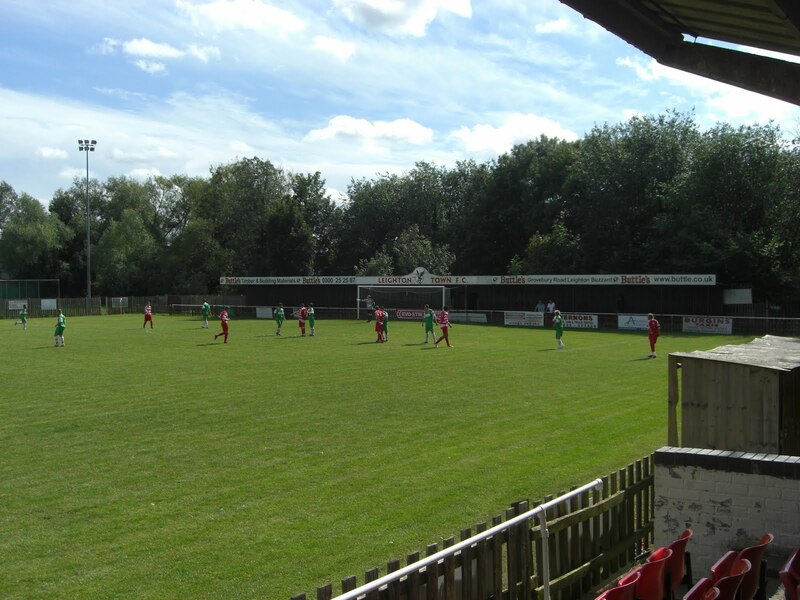 It is the home of Southern League Division One Central side Leighton Town with Aylesbury United temporarily groundsharing with them while they look for a new home having been evicted from their Buckingham Road stadium in 2006. There are no indications on the signage that Aylesbury United play their home games at Bell Close with the owners Leighton Town taking precedence. The ground is part of a larger sports complex and a cricket match being was being played simultaneously on the cricket pitch next door to the football pitch during the game. The two pitches are separated by the wooden fence which runs the whole way round the football ground. The north-west side of the venue running alongside the pitch contains the one all-seater stand in the ground, capable of holding 155 fans, as well as the team dugouts. On the south-east side of the ground, there is a standing area which runs up until about the half-way line before ending due to the angle of the fence encroaching up to the edge of the pitch. This is due to the cricket practice nets which sit on the other side of the fence. The north-east side of the ground contains the clubhouse as well as a small terraced area behind the goal. In addition there is also a small covered area on the right of the clubhouse where food is served from. Finally, behind the other goal on the south-west side of the ground there is another covered standing section. The game was between South Midlands League Premier Division side Aylesbury United and Hellenic League Premier Division side Bracknell Town. Right from the outset it was the hosts who took control of proceedings and that continued for the whole game. Aylesbury opened the scoring after 5 minutes with a header from close range after a free-kick was whipped into the box. Ten minutes later the lead was doubled with another header, this time from a corner. The rest of the half was dominated by Aylesbury who really should have scored several times more but lacked a clinical final touch. Into the second half and Bracknell's inability to defend set plays was exposed again with another close ranger header from a corner. With ten minutes to go Aylesbury added a fourth from the penalty spot although the 4-0 final scoreline flattered the visitors who were extremely poor.